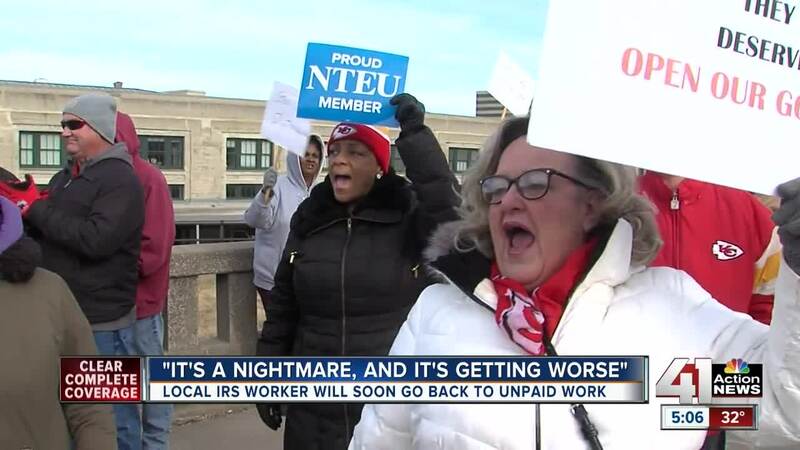 Soon the IRS building in Kansas City will have more workers in it, but they wont be getting paid. KANSAS CITY, Mo. — Soon the IRS building in Kansas City will have more workers in it, but they wont be getting paid. When we met Shannon Ellis last week, she was at home preparing for a rally. A week later, she is still at home. “We are looking at screwing up credit, it’s a nightmare and it’s getting worse,” said Ellis. Ellis is one of thousands of federal workers in Kansas City. She works for the IRS, where some have been working without pay. Soon she will get a call to work without pay as well. “It’s getting worse because we don’t see an end to this. They have dug in and they are not giving and unfortunately, we are the ones paying for it," Ellis said. Ellis is also the president of the union that represents Kansas City IRS workers. “We've got employees panicking because Missouri doesn’t allow employees to get unemployment if we are working without pay. They consider if we are working, its income that we've earned, and we are not entitled to," said Ellis. Meanwhile in DC, the fight continues. “Its time for both sides to sit down together, you have the president hanging around the White House saying he is ready to make a deal,” said Sen. Josh Hawley. New Missouri Senator Josh Hawley says all employees need to get back pay. But he thinks those being forced to work should get paid right now. “I also like to see them get paid now. I think we should be paying folks who are working on an emergency basis as essential personnel right now and we need to take steps to do that,” said Hawley. Back in Kansas City, Ellis and others are struggling to make ends meet. “We have looked into doing delivery services for food, but if we are working, we can’t do anything like that. We are working. We are working for free and that is not right,” said Ellis.